This page is about the American medium tank M48A1. For the version in the German tree, see M48A2 G A2. The 90 mm Gun Tank M48A1 Patton III is Rank V American medium tank with a battle rating of 7.7 (AB/RB/SB). The tank was added in Update 1.59 "Flaming Arrows". A first glance towards the M48A1 can give lots of similarities towards the M60. However, there are some aspects that can distinguish the M48 from the M60. The M48A1 is probably most distinguished first by its rounded turret and gun, with the square-shaped gun mantlet covered by a cloth. The 90 mm gun has a cylinder muzzle brake going in a T-shape while a fume extractor sits only slightly behind the muzzle brake position. The hull is distinguished compared to the successor M60 with its curved cast shape instead of straight welded plates. Belly armour is 38 mm in the front and 25 mm in the rear. Ammo racks for the M48A1. 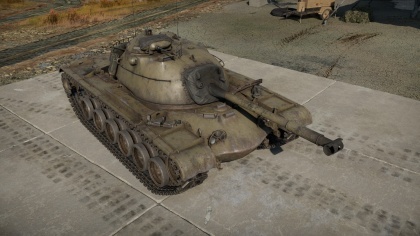 The M48A1 plays as a general medium tank, acting as a jack-of-all-trades in all of the tank's traits with average armour, firepower, and mobility. The M48A1 front hull glacis and turret are the strong points of the tank and have the best chance on the tank to bounce off rounds. However, its lower glacis and side armour remain a significant weak point for the tank, so take extra caution when exposing those weak points. One of the best ways to use this tank when a player does not have access to its HEATFS round is to refrain from using it as a brawler. This is because most of the shells that this tank has in its arsenal, do not have the ample firepower to eliminate most of the targets it faces at its BR. However, since the tank is incredibly mobile, it can be used as an excellent flanker. It can out-manoeuvre most of its medium tank rivals and expose their side armours. In February 1951, Ordnance opted for a new tank design to modernize the M46 and M47 in the U.S. inventory. The tank was designated the 90 mm Gun Tank T-48 and featured a new hemispherical turret, new hull, and an improved suspension. 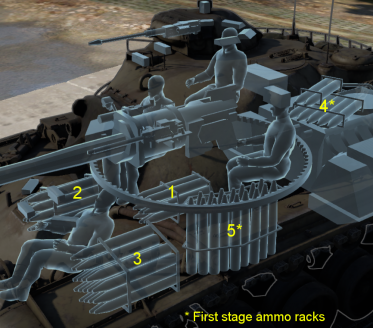 The new design was also the first to remove the hull machine gunner position in American tanks, reducing the total crew from the usual 5 to 4. 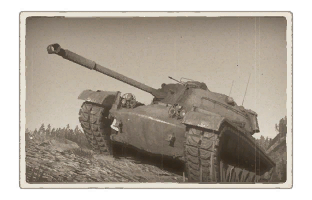 Further testing and trials with the T-48 design proved its worth and in April 1953, Ordnance standardized the design as the 90 mm Gun Tank M48 Patton, which would be the third in the Patton series, all named after General George S. Patton. Production started in 1952 with the original M48 models. During the initial production run, several hundreds of the M48s were found to not be up to the standard protection ratings it should be, these were relegated to training tanks as the M48C. The model was developed into the M48A1 with a redesigned driver hatch and commander's cupola that integrates a .50 cal machine gun for the commander to use. Next variant was the M48A2 with an improved power pack and transmission, along with a new rear plate and improved turret control. The M48A1 models improved with the M48A2 specifications in 1959, up to 1,019 were converted and are labelled the M48A3. The last major model was the M48A5, which is an upgrade of the M48 models in the 1970s with a 105 mm Gun M68, up to 2,069 converted. In total, about 12,000 M48 models were produced in all from the time period of 1952 to 1959. The Americans mainly used the M48A3 Patton tanks in Vietnam, with 600 models deployed. Each battalion in the US Army and Marines armed with the M48 Patton had 57 tanks each. The Armored Cavalry Squadrons were initially armed with M48s before they were replaced by the lighter M551 Sheridan. A flamethrower variant was developed from the M48, which became known as the M67A1 "Zippo". The M48 also strengthened the Army of the Republic of Vietnam (ARVN) forces by supplementing their M41A1 Walker Bulldog light tanks. The main armour conflicts between the North and South Vietnamese forces usually involved an armour mix of T-54/PT-76B for the North and M48 Pattons/M41A1 Bulldogs for the South. In the conflicts, an incident on 23 April 1972 had an NVA anti-tank force with the new 9M14M Malyutka anti-tank guided missile destroy an M48 Patton, marking one of the early uses of the wide-spread infantry anti-tank missiles. Despite that, the M48s performed favourably in the Southern forces. Even after US forces withdrew from South Vietnam and North Vietnam started the Ho Chi Minh Offensive in 1975, the M48s left in the ARVN hands were able to hold back the assaulting T-34 and T-54/55 tanks, only falling when supplies ran out. After the war, the Americans mainly replaced their main tanks with the M60 Patton. Like with most of the American equipment, the M48s were supplied to NATO allies across the world to assist in their conflicts. They became involved in the Indo-Pakistani War of 1965 and 1971 in the hands of Pakistan along with some M47s against India's Centurions. Its overall performance in the conflicts was that they performed very well in the battlefield, only failing due to the poor tactics used by the armour forces. The M48s also saw service in the Middle Eastern conflicts. It was notably used in the conflicts against Israel in the Six-Day War of 1967 and the Yom Kippur War of 1973 in the hands of the Israelis and Jordanian Army. The Israels upgraded their M48s with the 105 mm guns, about 5 years earlier than the Americans, and fight against the Egyptian Soviet-supplied armour. They also saw use in the Lebanese Civil War in the hands of nearly all sides involved. They were also used in Turkey's military in the Turkish invasion of Cyprus in 1974. The M48s were also used in Iranian hands in the Iran-Iraq war against Soviet-supplied weaponry in Iraq's hands. Morocco also received a hundred M48A5 Pattons from America in 1987. One of the most recent conflicts the M48s were used was in the Battle of Mogadishu in 1993 when assisting the stranded US Rangers and Delta Force in the city. The M48s were used by 19 different countries in the world during its service life, of which 9 countries still use in varying quantities. Despite being rather outdated in the later part of the Cold War, which warranted its replacement by the M60, the M48 help supplemented the forces around the world in their conflicts. With many models remain in inventory across the world, it still proves a valuable weapon against countries without advanced anti-tank weaponry. Skins and camouflages for the M48A1 series from live.warthunder.com. This page was last edited on 2 April 2019, at 03:22.